Brief (Where we’re at): Red has been cleaning house, cracking down on associates in his network who took advantage of his time in prison to freelance. One group, including Smokey Putnam, had even diverted Red’s assets to traffick methamphetamines, which Red heartily disapproves of. Those miscreants Red killed. Red is also questioning these associates to see if they had turned him in to the police. All have denied it, so Red has amped up the pressure by killing Smokey in a dramatic way (dropping him from his airplane) to “send a message” to anyone who knew who betrayed him to come forward. He explained his rationale to Dembe ~ placing Dembe in a dilemma since Dembe knows it was Liz who turned Red in. Liz begged Dembe not to tell Red and (so far) Dembe has kept Liz’s secret. Liz has been able to let go the entire matter of Red’s true identity, but Ressler has continued to pursue it, leaning on a friend in the CIA, MJ Ward, who had run point on the CIA’s efforts years earlier to find out what had happened to Liz’s mother, Katarina Rostova. It has long been assumed that Katarina died by suicide, but there have been a couple of possible sightings over the years. Together, Ressler and Ward followed up on one of them which has turned up someone who may be Katarina’s mother, 81, now living under the alias of Virginia Lopatin in Chicago. In the matter of the plot of DOJ Deputy Director Anna McMahon (and President Robert Diaz) against the interests of the United States, Red directed the task force to look into one of his associates, Henry Morris (a gambler who became a target of Blacklister #69 Lady Luck), who informed Liz that he had done some work for the code-named group “The Third Estate.” Cooper had found the case of “The Third Estate” in the files of hostile-taker artist Olivia Olson (Blacklister #115). Liz found out Henry Morris had set up state-of-the-art surveillance equipment for “The Third Estate” to allow for hacking into high-end security systems in private homes. 🔆 This❗️⋙ The next episode of The Blacklist airs on Friday, April 19, 2019 in the US, starting at 8pm CT.
🔴 Who Is Raymond Reddington? 🔴 What Is She to You Really? New‼️ ⋙ If you’re a Lizzington fan – or even if you’re not – check out Φαιη Βλαχογιαννη’s analysis ⭕ “Beyond Lizzington”. ⋙ Note: This “Clues” page is updated for Season 6. If you are looking for something no longer on this page, you may still be able to find it in the Attic. ⋙ Follow me on Twitter at @BlacklistDCd. For occasional updates on what I’ve been up to on this blog, check Scribblings & Scuttlebutt. There are several options. You can search hashtag #TheBlacklist or follow accounts assisted with the show such as @NBCBlacklist or @BlacklistRoom (Blacklist Writers). 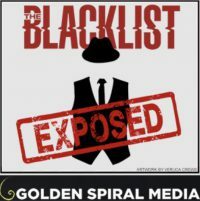 Some Tweeps (Twitter people) who tweet a lot about The Blacklist are listed under “Black Sites” on this blog: The Blacklist Cast and Crew on Twitter and Blacklist Fansites on Twitter. There is an “Cast and Crew” Twitter list set up by NBC. Instructions on how to follow my Twitter List “NBC Blacklist” are below. A Twitter List allows you to see all the Tweets of those who are “members” of the list. 3. Many fans who feature The Blacklist in their Twitter handle, avatar, Twitter bio or header photo. Alternatively, you could follow the hashtag #TheBlacklist or NBC’s Twitter accounts @NBCBlacklist or @BlacklistRoom (Blacklist Writers), but people don’t always include these in their Tweets. Especially around the time the show airs, a lot of people will be Tweeting about the show and following along on Twitter puts you in the middle of the action. You don’t need a Twitter account to do this. Note: Although my Blacklist-oriented Twitter account is @BlacklistDCd, I set up my Blacklist Twitter List before I created that account, so the Twitter List is still under my general Twitter account @Auriandra.